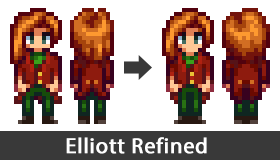 A refined sprite for Elliott with improved hair and face shape. Also gets rid of the leg gap and other tweaks. This is a refined version of Elliott's sprite which I felt looked awkward and out of place next to the other bachelors. There are many tweaks including hair, face shape and outfit.
. This mod replaces the original Elliott.xnb sprite. Please make a backup of the original file if necessary.
. Unzip or extract the Elliott.xnb file after downloading.
. Place the file into the Stardew Valley folder under Content\Characters and replace Elliott.xnb.